Our historic – and largely still current – curatorial approach to archaeological and artistic objects has been to divide and classify, to separate and categorise. This has its advantages, but those institutions like the Pitt Rivers Museum in Oxford where form is privileged over origin, and Tate Modern where there is a thematic approach, show that alternative strategies can be worthwhile. By listing artworks without prejudice to civilisations, geographical location, art movements or other artificial categories, it takes away the inherent divisiveness of categorisation to allow some remarkable comparisons and invites us to consider links where we had not seen them previously. 30,000 Years of Art does note a basic classification, e.g. Post-impressionism or Nasca Culture plus a geographical location, but these play second fiddle to a straightforward chronological listing. We therefore find that sharing double page spreads may be Arabic scripts and Chinese brush paintings, the Venus de Milo and a Mayan mural, or a Mexican mask and an Ethiopian stele. It is in this removal of all art historical classifications and hierarchies that to us is 30,000 Years of Art main achievement. By presenting a thousand masterworks in chronological order, it shows what was being created all over the globe at approximately the same time. The result is a remarkable insight into the interrelationships between seemingly unrelated cultures and civilisations as well as celebrating the diversity between those that may be considered similar. The resulting timeline of works leads to compelling browsing with the juxtapositions offering intellectual pleasure and a sense of wonder and discovery. This is a book that can be a real coffee table book to be dipped into and enjoyed at leisure, the entries simply and clearly written and easily understood. It can be usefully read chronologically or utilised as a vital reference book taking the reader on a global and historical journey, as a Chinese Shang urn stands next to a Mycenaean vase, and Michelangelo’s Slave is followed by a contemporaneous male sculpture from Nigeria. As a research or reference book, it would also be useful alongside more comprehensive texts with the arrangement responding to such questions as what were artists creating in China or Africa while Rembrandt was painting self-portraits in Leyden? How were similar subjects – the female form, landscapes, religious scenes – manipulated by artists in Han China or Medieval Europe? Although the sequence is chronological, the selection of entries for an individual culture comprises an abbreviated history of the art of that people. Thus, while artworks from ancient Greece or the European Renaissance or pre-Columbian Americas are interspersed with contemporaneous works created in Africa, India or Japan, an extraction of the Greek or Renaissance or American works could stand alone as an essential summary of the finest art of that period or culture. 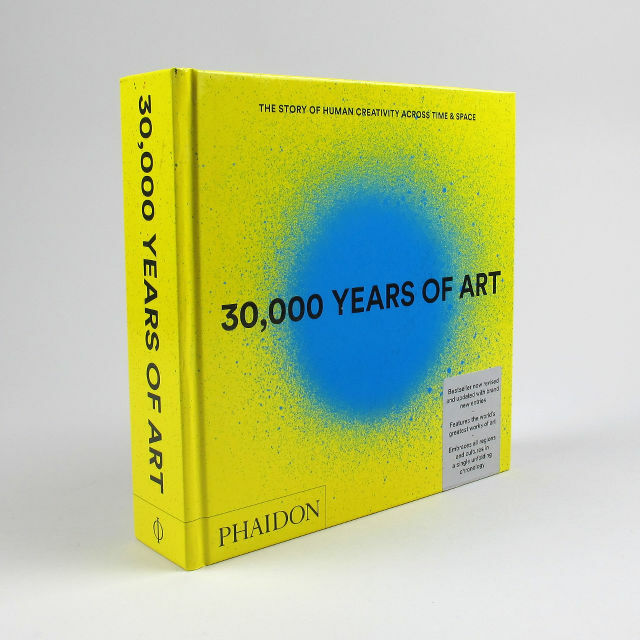 It is coincidental and rather appropriate that the latest edition of this book closes its chronological review of 30,000 Years of Art in 2010 with James Turrell, the subject of CELLOPHANELAND‘s most recent arts feature. Both the book and the artist suggest a more considered or even spiritual approach: we can look at the individual works – but stepping back and examining the bigger picture can often be more rewarding and insightful. It is also appropriate in that Turrell‘s artwork – the Roden Crater – is ‘constructed’ from an ‘extinct volcano and light’. As two of the primal forces that created life this neatly brings us full circle from the opening page where, at the dawn of man a ‘lion man’ was being carved somewhere in present-day Germany. This is a volume that will deserve repeated use and surely is a compelling addition to any collection, or coffee table. Highly recommended.